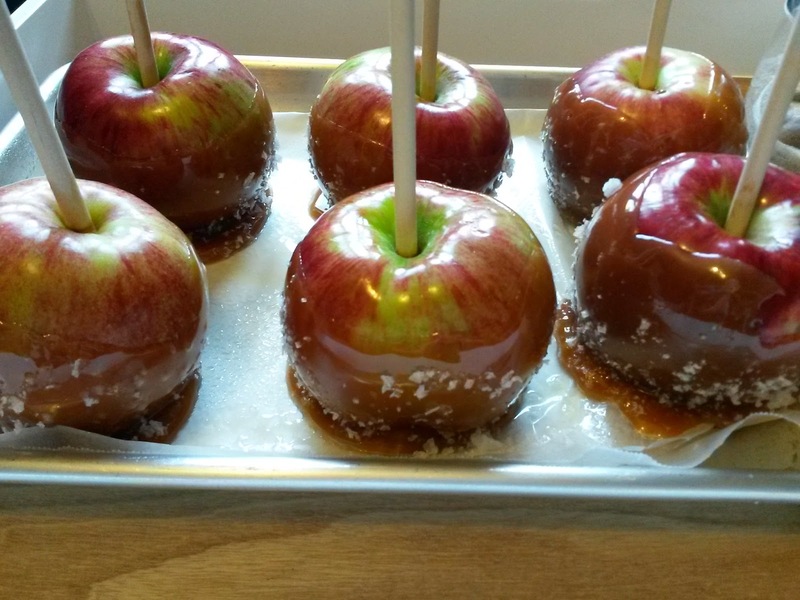 I love making caramel apples in the fall. Chris and I had actually hoped to prepare salted caramel apples as favours for our winter wedding; we bought five or six bags of grocery store apples, only to decide at the last minute that it was just going to be too much work (after all, we also made our wedding cake, and other desserts, including cookies and pies). 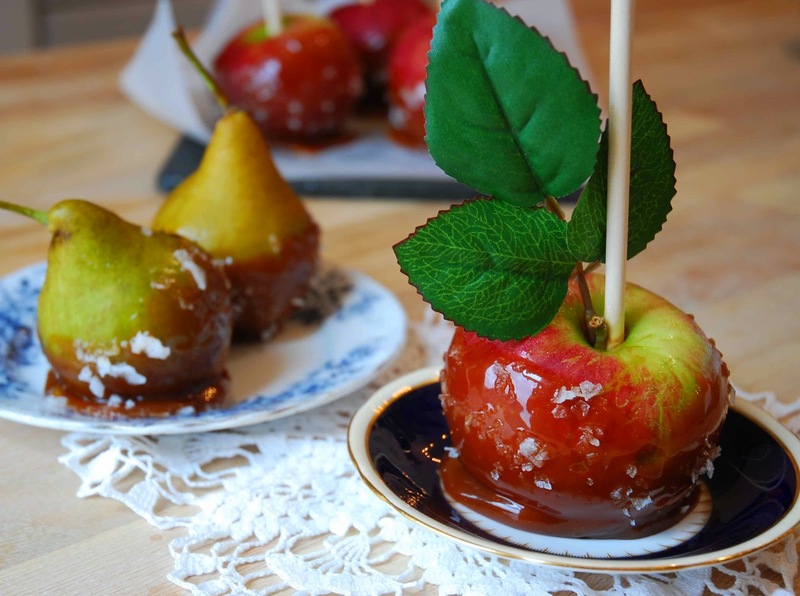 Excuses aside, we've prepared caramel apples for just the two of us for the last couple years, so with the Halloween candy season upon us, I thought I would share my favourite recipe and some of the tips that I've learned. Because caramel making is tricky, but making this treat doesn't need to be scary. (That was my Halloween play on words. Hahaha. Hilarious). You're welcome. Mix sugar, corn syrup and water in a small saucepan, bring to a boil over medium-high heat, stirring only until the sugar dissolves. Cook, swirling the pan, until the mixture reaches 320 degrees F on a candy thermometer, about 8 to 10 minutes. Remove from heat and slowly whisk in cream and then butter, followed by vanilla and salt. Return to low heat and whisk until smooth. Let caramel cool until it thickens and can coat a spoon. 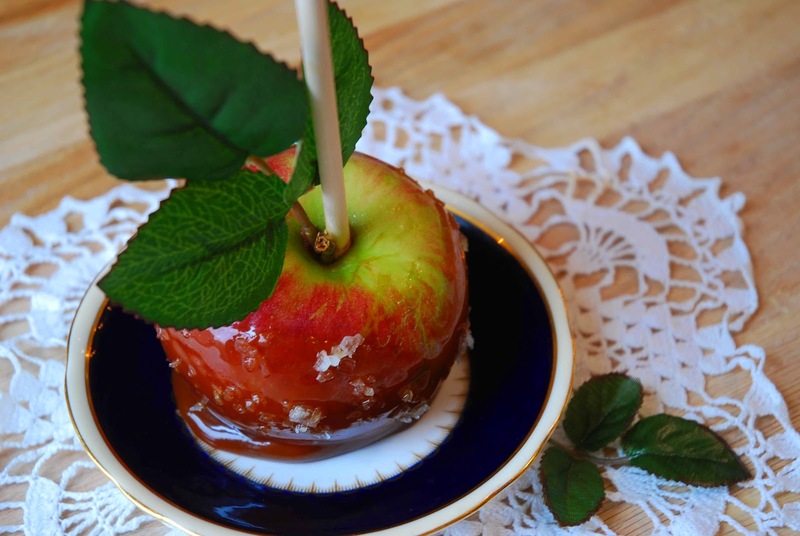 Insert dowels or sticks into the stem ends of six apples and dip in caramel. Let the excess drip off and sprinkle with toppings if desired. 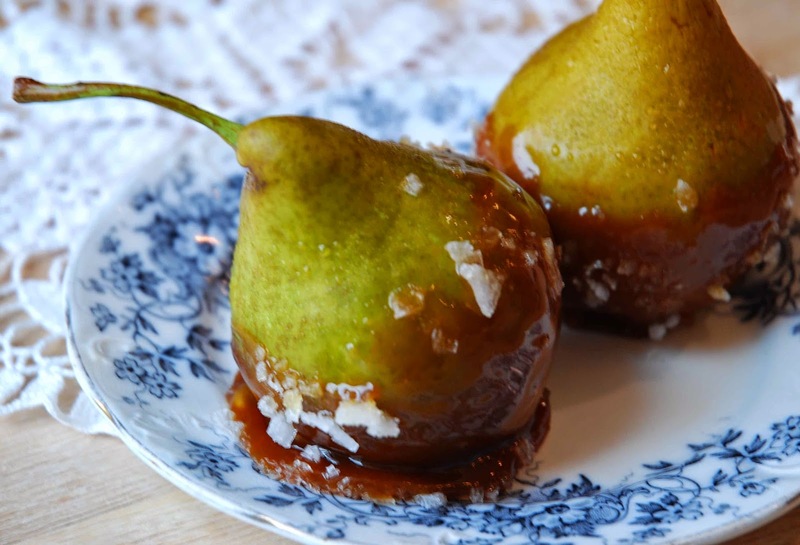 (I used Maldon salt flakes to create salted caramel apples). 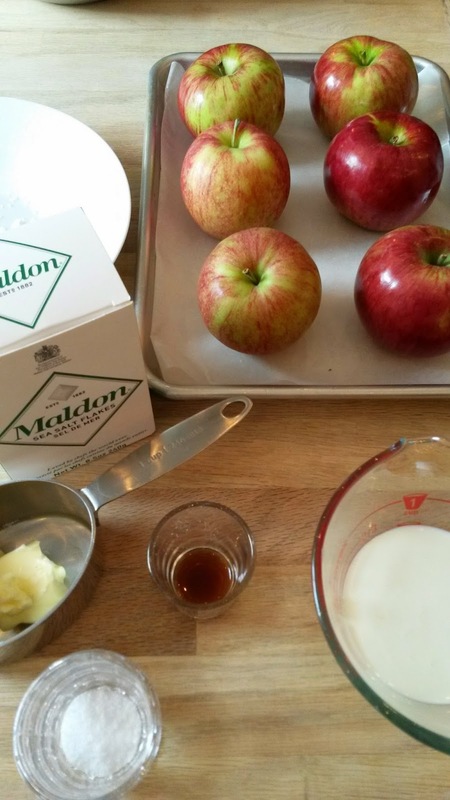 The result will be wonderfully smooth and buttery caramel apples. They look lovely and they also taste amazing! I cut the apples into slices and they were a wonderful snack. This recipe is from the Food Network (see original recipe here). Normally for something like this, Martha Stewart would be my girl, but her recipe just wasn't as good. I tried it and it doesn't have the buttery taste and texture of this recipe (probably because her's doesn't use any butter), and Martha's recipe is also not as specific (she asks you to keep your eye on the colour of the hot sugar, instead of on a candy thermometer) and to me that's just asking for a pot of burnt sugar! Actually, when I tried her recipe my sugar mixture did get a bit too dark, and the result was bordering on bitter. 1. Let ALL the excess caramel drip off. If you have a coat that is too heavy, it will pool at the bottom of the apple and will look weird. 2. If using a delicate topping like salt flakes, sprinkle don't roll. 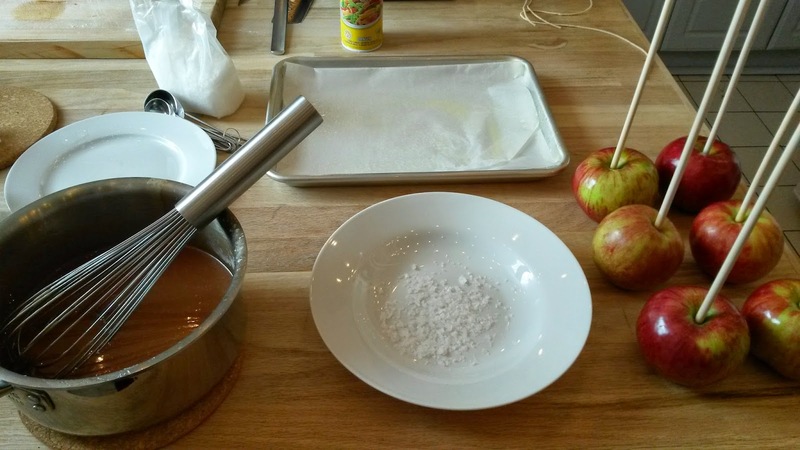 Attempting to roll the caramel covered apple in something as small as salt will just create a mess. If you want to coat your apple in something larger like smarties or pretzel pieces, then roll away! 3. Put your apple in the fridge as soon as possible. Leaving the caramel apples at room temperature is not an option. They are best kept in the fridge so that they hold they're shape. 4. To decorate the apple, purchase fake flowers from the Dollar Store, and use the leaves as decoration on your apples. 5. If you want to wrap up the apples to give as gifts, purchase small or medium size cellophane candy bags from a bulk store. The bags will fit right over the apple and you can fasten them around the dowel. Using the bags is a whole lot easier than attempting to work with a roll of cellophane. Only 9 more days til Halloween!